Jean Dufy was the younger brother of Raoul Dufy, brothers from a family of nine children. The Dufy family was very open to the arts, particularly to music. From the age of 14, Jean exhibited his artistic abilities which were encouraged by his brother Raoul, and Raoul’s friend A.E. Othon Friesz. Jean also painted theater sets. He enrolled in l’Ecole des Beaux-Arts du Havre, where he was taught by Raoul and then by Friesz and Georges Braque. However, Jean quit these studies to rejoin his brother in Paris who remained his true master for the rest of his life. Jean had, at this period of his life, discovered much from travels to North Africa and other European cities. World War I, in which he was a horse-soldier, interrupted his activities for a while. In 1920, he exhibited his recent paintings, notably at the Salon d’Automne, of which he was a member. Along with Raoul, Jean was active in the decorative arts, especially in textiles and porcelains. 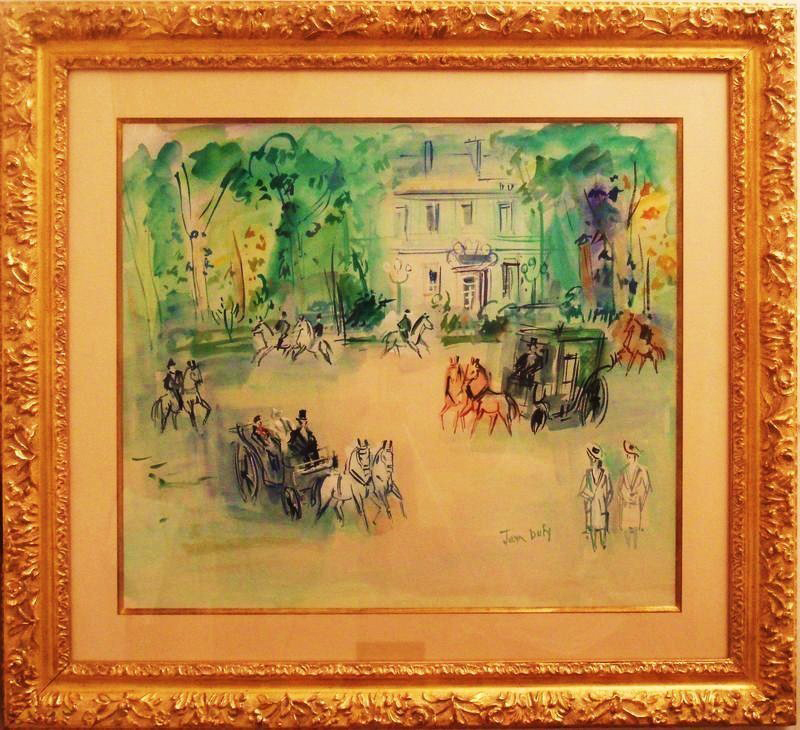 Jean Dufy traveled extensively in the 1950s, the last decade of his life. He returned often to his hometown of Le Havre and to his mother's birthplace of Honfleur, as well as to many other locations in Europe and to North Africa. However, judging by his many scenes of Paris, it was the location that for him was most fascinating: "the streets, the horse-drawn carriages, the Eiffel Tower, the sky, and the Seine." (Bailly) Inevitably, Jean Dufy’s work continues to be compared to that of his brother. Jean painted frequently in watercolor and ink. Like his brother, his subjects are often Paris, other French cities, country scenes, circuses, horse races, stages and orchestras. He played the classical guitar and was an amateur of jazz, which may account for his paintings exhibiting a more fluid rhythm revealed in deep blues, animated reds and greens, and yellows that tend to accentuate light. Jean retired to his farm in the Loire River valley and died May 12, 1964 in the French village of Boussay. His wife, Ismérie, had died two months earlier. The work of Jean Dufy has become highly regaded in the post impression world and extremely valuable.